Took the time to go to a concert of contemporary music tonight, a rare pleasure for me these days. Psappha, at the Royal Conservatoire of Scotland, playing a concert of largely new work. Sean Friar’s Scale 9 which opened the programme was likeable and energetic, a sort of andante and allegro, or rather andante and blues, in a post- (very-post-) Gershwin vein. Nice to see an ensemble conducting themselves. I like my flavours strong and simple, and Francesca Le Lohé’s Blind Men and an Elephant was a little too detailed and finely wrought for my taste. It had the merit of turing out to be shorter than I thought it would be, which sounds snarky, but is actually an honest and well-intentioned comment: a compressed, rich piece. Shows how out of touch I’ve become that I didn’t even know Gordon McPherson had a big three movement prem tonight, Stunt Doubles. The gag here was having a synthesised ensemble play along with the real players. This worked very well: even just a few years ago this would have been a very different piece, but today’s huge sample libraries make a much better job of it than the old 128 midi sounds. The first movement was… maximal, a million notes, but still very clear and structured. In the second movement Gordon dipped into a jazz bag which he normally keeps very well hidden, up in the loft somewhere behind an old sofa: we all liked this. The third movement gave me some pause, with a slightly, er, naff, pastiche, of a filmic whistly-march type tune. The end of this piece oddly made more sense to me, where we heard this tune again, this time on the synthesised ensemble. Overall I thought this was a good piece, a bit tiring in places. Dimitrios Skyllas New Miniatures for the Universe rather exceeded my C21st 140-character attention span. Seemed to be rather large miniatures. And, the Steve Reich Double Sextet: boring. But, very well played by Psappha, as were all the pieces in this well balanced and engaging concert. ‘The lines between technology and the arts are blurring at an astronomical pace: the latest laptops and computers position themselves not only as tools for business, but as home entertainment centres where anything seems possible. J. Simon van der Walt, performing as part of the Cryptic Nights season, parallels this revolution yet takes it back to the ‘Bare Wires’. As Edward ‘Teddy’ Edwards and the Electr-O-Chromatic orchestra, he presents and electronic symphony of music and performance. Van der Walt’s imagination takes us on a technologically devised musical jourrney with improvisation, composition and electro-junk. His passion as a performer, actor, director and composer is apparent, and he strives to blend musicality, innovation and theatricality into one. 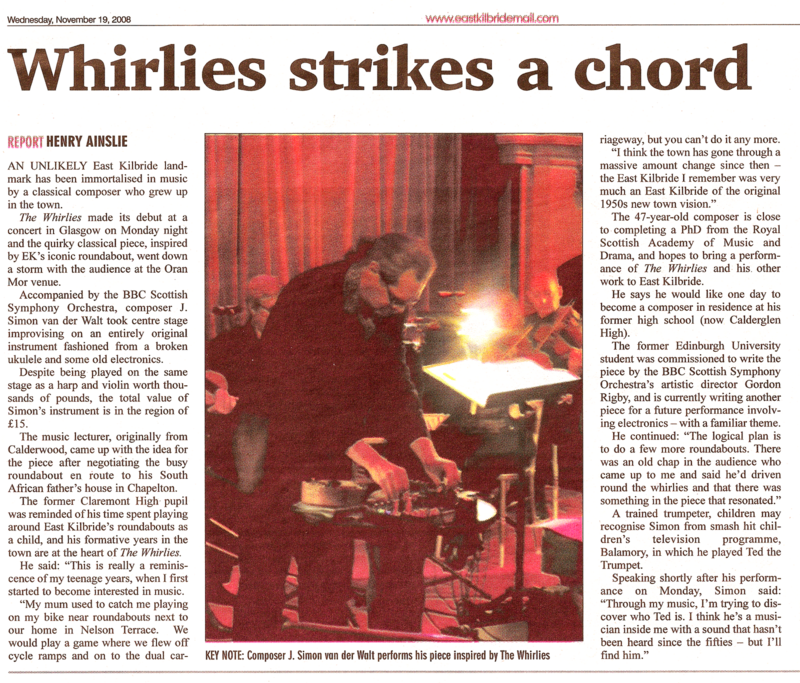 ‘The new music came from J Simon van der Walt, whose The Whirlies pitted his own prepared multiphonic scrabbling with table-top banjo ukulele and electronic gizmos against lush concert-orchestra strings – a collision only enhanced by the shattering of a glass behind the bar. ‘Let’s not mess about. Never mind technical shortcomings, rough edges, the fractured tenor who was clearly in discomfort. Last night’s offering by RSAMD students in the academy’s festival of new music, Plug, gets five stars for the originality of creative thought that flowed from student composers Simon van der Walt and Gareth Williams into two new works for theatrical performance. In another era, van der Walt’s Schaduwee would have been called a song cycle. This creation, for soprano, four bassoons, piano, electronics, kazoo, projected images and some horseplay (I’ve never seen the pianist hilariously heave out the innards of a prepared piano as part of a piece) was something else, though there were enough Malherian devices to give a hook into the familiar. The piece, a musical, literary and theatrical questioning of language, was abundant with ideas, arcane and mundane, but was dazzlingly performed by stratospheric soprano Alexa Mason and her team of intrumentalists. Gareth Williams’ one-act boxing opera, Love in the Blue Corner, is like nothing else I’ve seen in a theatre. It turns its subject inside out. There is only one boxer. He’s a loser and he dies, beaten to a pulp. He stands, silent and still in the read-lit centre of the ring, while a make-up artist daubs him with the sweat, bruises, cuts, fractures and wounds that leave him wrecked. The action of the match is in Williams’s postminimalist, postmodern music, belted out by the ensemble, and given voice by the trainer, who exhorts his stubborn failure of a protege to move, jab, dance, persist.